Our race didn’t start until 10.25am, and we weren’t too far away (and had picked up our numbers the day before), so we didn’t need to get up that early. Because of the other races (full and half marathon, a 5k I think) all starting at earlier times, we didn’t want to get there with the other racers. We decided to leave around 9am, knowing that it was around 25 mins but the traffic was doubling that. We did get a nice t-shirt in the pack (and a wrist sweatband) but I always think it’s a bit unlucky to wear it before- what if you don’t finish for some reason? Anyway, the traffic was fine until we got to the entrance to the car park where we joined a queue (this must have been at around 9.40am). It was moving all the time, but very slowly, and snaked through the forest. We had paid for parking when we picked up our numbers, but it seemed that each time one person had to pay, the entire queue stopped while the marshal sorted out the money and change. We ended up parking at 10.15am and then speed-walking though the fields to the start. We thought we had 10 mins, but in fact the race started around 10 mins late, so we got to join in with the rather enthusiastic warm up. The plan was to run together and enjoy it with no time in mind (hopefully under an hour but not really minding). The route went through the forest, gently undulating but no big hills. There were some funny signs to read along the way (“Watch out for bears” being my favourite, as well as signs over a bridge saying “dry feet” and then another one pointing to the river saying “wet feet”) and the scenery was gorgeous. At first it was very congested as the paths seemed a little too narrow for the number of runners, but after a mile or so the paths opened up and we could stop the constant overtaking and settle a bit. I’d be interested in seeing all the routes on the same map (as an overlay)- there was marathon and half happening at the same time, and every now and then we’d join with another lot of runners with different coloured numbers. Sometimes we’d follow them, other times we would peel off in a different direction. Our numbers were blue so we had to follow the blue signs- it was very well signed plus there were loads of marshals at every joining point so you couldn’t go wrong. There were a couple of water stations but we avoided them. I did like it that they said if you were caught dropping litter you would be disqualified, but then at the water stations they had cups (good) but were telling people to throw their cups on the floor, even though they had a few bins- I really don’t think putting your cup in a bin is going to slow you down that much. At times the paths were quite stony and a few times I twisted my ankle or got a big stone wedged in my shoe- I should have worn my trail shoes because the soles are thicker but as it had been dry I’d gone for my normal road shoes. It was fine as most of it was on soft forest paths and a few bits of tarmac. Although it was a bit cloudy, it got really warm and I really regretted not having a headband on to keep the sweat from my eyes. I had worn the sweatband on my wrist but that got soggy fairly quickly so wasn’t much use! The miles ticked by quickly (they actually had km signs for the 10k but I used my watch) and it didn’t seem like long before we were heading around a field and into the finish area. Andy wanted to have a strong finish but my legs were feeling tired from the 7 miles on Saturday, so he ran off and I tried to catch up with him (flashbacks to every parkrun with my Dad! )- mile 6 was my fastest mile at 9.03 with an 8.37 for the mini bit. My chip time was 58:42, and there was a lot of detailed info on the website (I was 98th women out of 747/ and position 364 out of 1259 runners). The text didn’t come through for a few days which was weird as usually the text things come instantly, but that doesn’t bother me as I could see my time on the website if I really needed to know asap (I didn’t). The finish area was well organised too- lot of teenagers (in sort of army uniform) handing out medals, water, bananas and goodie bags. A banana after a race is my favourite. I was a bit miffed because Andy got some bourbon biscuits in his bag whereas I got some plain ones. The goodie bag had a big box of fish oil in it (not so good for vegetarians) as well as some sun cream which will come in handy. The medal is a lovely chunky one, with different coloured ribbons for each distance (to match the numbers and signs). On the website they also had this cool image to show you the people finishing around you (I’m the blue dot). 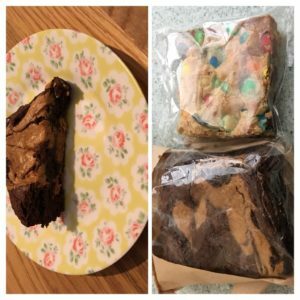 We wandered around the stalls for a bit and bought some brownies from the Peachy Cakes stall- a vegan peanut butter one which we shared that evening, and then one with oreos and m’n’m’s which we shared on Monday. I quite liked the magazine that we got with our numbers. I’d been to the New Forest before but never seen that many horses, however this time around we saw so many horses, plus wild donkeys and even wild cows. I wasn’t sure if some had just escaped but it said in the magazine that there were something like 150 wild donkeys and loads more cows. After the wander we found the car (thankfully we’d parked near the end of a row as I think it would have taken us ages otherwise) and headed home. We stopped off at the services for a hot chocolate as for some reason I really fancied one, and made pretty good time (considering the M25 on a Sunday). All in all I really enjoyed the race- it had a lovely atmosphere, loads of marshals, nice scenery and was well organised. I think if they made people pay for parking in advance then there would not have been the long queues to get in (or just add the fee on to the race entry as it was fairly reasonably priced). 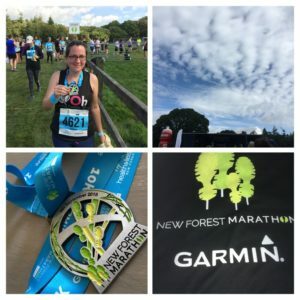 Have you been to the New Forest? Would you wear a race t-shirt during the actual race? I always prefer to save my race Tshirt until afterwards. Usually I rely on having that as a change of top for the journey home, allowing me to race in something tried and tested. 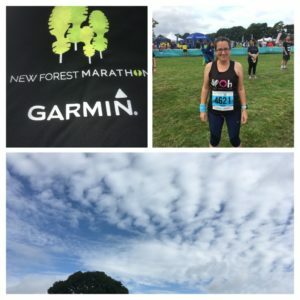 Previous Previous post: Rushmoor parkrun- one step closer to Bingo!